The Coalition of Unemployed Private Nurses (COUPN) has threatened to embark on a huge demonstration if government and the Ministry of Health do not offer jobs to their members. The group which has accused the government of gross discrimination in their quest to securing jobs for its members has therefore given government a 10-day ultimatum to do something about their situation or witness one of the biggest picketing to ever take place in the country. 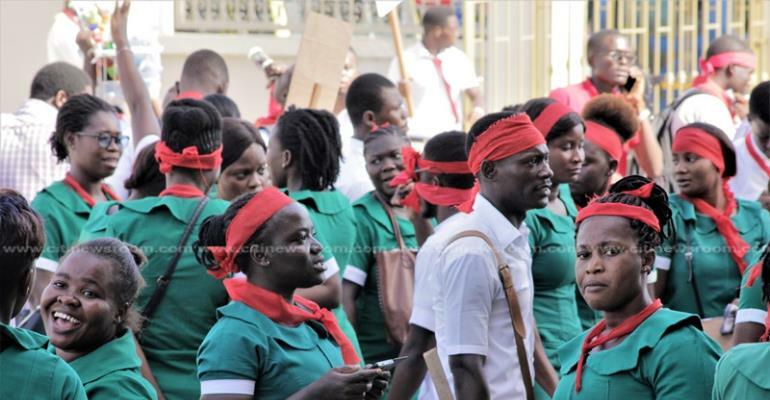 The frustrated trained health workers say they have been home since 2012 and have been searching for jobs whiles hoping that government together with the health Ministry will help place them in the health institutions. COUPN leaders explain that they have participated in several discussions with the ministries involved to get their grievances addressed but all to no avail. They are therefore not taking things likely and have vowed to hit the streets of Accra as well as other Regional Capitals across the country in 10 days’ time if their grievances are not addressed. Addressing a press conference in Accra today, 18 March 2019, spokesperson for the group, Doreen Boateng indicated that the president promised not to discriminate against any group of persons in his last state of the nations address but has gone back on his vow with actions, which proves that the government feels nurses trained at private facilities are “irrelevant”. She further bemoaned the fact that there seems to be no plans by government to find employment for trained private nurses into the mainstream health sector. “There is no plan to recruit privately-trained nurses into the mainstream health sector by the government, as it is being done for state-funded nursing training institutions”, she said. In all, hundreds of private nurses are expected to embark on a series of demonstrations across the country in 10 days’ time if government do not address their plight.